Jag älskar hennes böcker och denna är inget undantag, har svårt att släppa den.. Tyvärr har jag inte hittat några uppgifter om när denna kommer på svenska. Del 1 & 2 (Den vita drottningen och Den röda drottningen) finns dock på svenska. 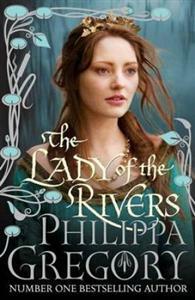 Number 1 bestselling author Philippa Gregory continues her series, "The Cousins War", with Jacquetta Woodville, mother of the White Queen. Jacquetta, daughter of the Count of Luxembourg and kinswoman to half the royalty of Europe, was married to the great Englishman John, Duke of Bedford, uncle to Henry VI. Widowed at the age of nineteen she took the extraordinary risk of marrying a gentleman of her household for love, and then carved out a life for herself as Queen Margaret of Anjou's close friend and a Lancaster supporter - until the day that her daughter Elizabeth Woodville fell in love and married the rival king Edward IV. Of all the little-known but important women of the period, her dramatic story is the most neglected. With her links to Melusina, and to the founder of the house of Luxembourg, together with her reputation for making magic, she is the most haunting of heroines. För mer info, kolla på ADLIBRIS!